An intensely wonderful nibble! Danielle made this for a class at Brooskide Gardens January 22 2014 and again the next day at US Botanic Garden. Melt the chocolate over a double boiler or a bowl set over simmering pan of water. Add the vanilla, stir thoroughly. Place a sheet of wax/parchment paper on a small baking tray, making an oblong or round shape about 8 inches. Pour melted chocolate on to the wax paper. 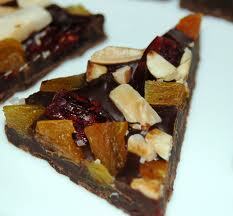 Sprinkle over the dried fruit and nuts. Let harden completely (put in the freezer for 10 minutes to make it go faster). Break into pieces for serving. Makes 6-10 pieces. This entry was posted in Desserts, Recipes from Danielle's pantry, Vegetarian and tagged almonds, apricots, chocolate, cranberries, nuts. Bookmark the permalink.